Our trip through Central America continued north to Mexico’s sparkling Caribbean coast. Finding the strength to peel ourselves away from the postcard beaches of Ambergris Caye was tough, but we pushed through it knowing that our next destination was going to equally impressive. It’s no secret that Mexico’s popular Riviera Maya has quickly become world renowned for its lavish resorts and family vacations. 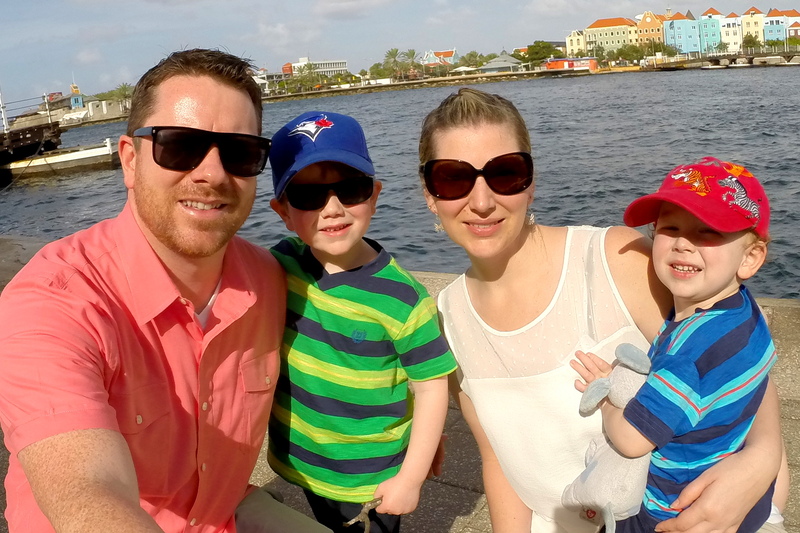 A few years ago, we brought our family and friends to the Yucatan for our destination wedding. It was a wonderful experience that we continue to encourage engaged couples to consider. But we had a different agenda for this trip to Mexico. We wanted a destination that was quiet, relaxing and directly on the beach. Basically, we wanted a romantic getaway rather than a party weekend at an all-inclusive. Our friend from Vancouver had the perfect solution for us. He recommended that we check out Azulik Resort, a cluster of private seaside villas located directly on the Caribbean Sea. After checking out its website, we were instantly sold! 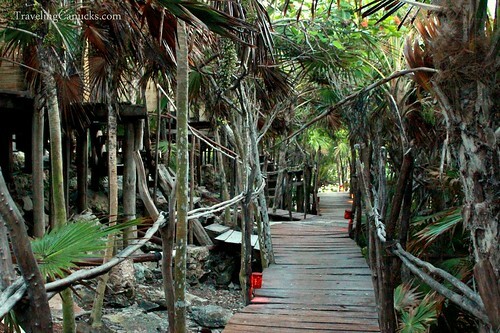 Like many, we were aware of the Mayan Ruins of Tulum. After all, it’s one of the most popular tourist attractions in the Riviera Maya. 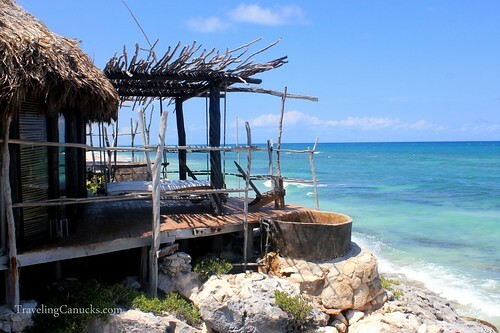 We also heard that the town of Tulum was worth a quick visit, but we hadn’t thought about actually staying on the coast of Tulum. We just assumed that the place to be was between Cancun and Playa del Carmen. We were glad that we challenged that perception! The secluded palapa-roofed villas are built on top of shallow cliffs that hang over the sea, with unobstructed views of the turquoise Caribbean below. 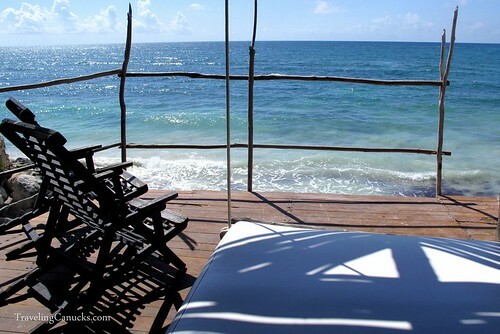 Azulik Resort can proudly boast that it is a true beachfront eco-lodge. The rooms do not have electricity. There are no lights or power outlets. There are no telephones or televisions. Instead, candles supply the light, the sea provides the entertainment and the cool ocean breeze keeps the temperature just right. 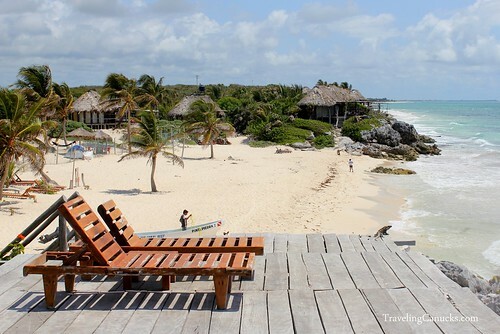 We really liked Tulum’s coastal strip. 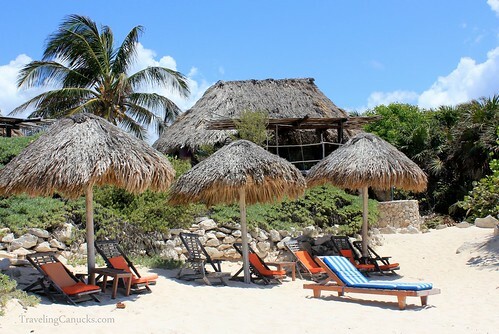 It has a laid back Caribbean vibe that is quite different from the touristy Mayan Riviera located just north of Tulum. 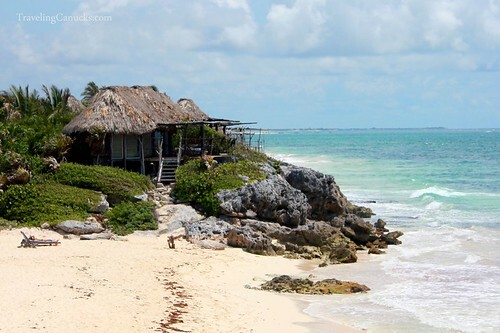 The strip has a handful of local restaurants and shops, access to private white sandy beaches, and the Tulum ruins are only a short 5-minute drive away. The hotels and restaurants are mostly small and original, with no major brand names or enormous all-inclusive resorts (if you’re looking for a Margaritaville or crazy nightclub, you’re probably better off staying in Cancun or Playa del Carmen). Azulik is an adult only resort that caters to couples wanting something different from the typical hotel experience. Hours and days were lost on our villa’s wooden deck, swinging on an outdoor bed and soaking in our private tub with a cold Mexican cerveza in hand. The absence of electricity forced us to open our books and commit to days of uninterrupted relaxation. The soothing sound of water crashing on the shore quickly became the soundtrack of our private Mexican retreat. You have no choice but to unplug, relax and enjoy the view! 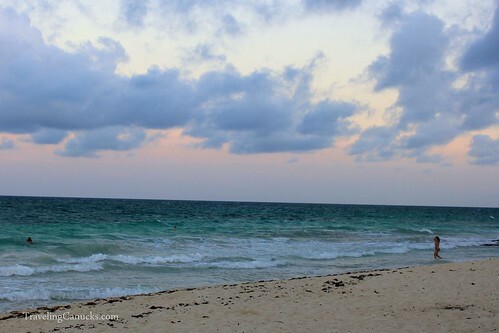 Have you visited the beaches on Mexico’s Caribbean coast? What did you think? Most people have no idea how beautiful that coast of Mexico really can be. They are also intimidated by stories about Mexico being dangerous when, in reality, this area is as safe as any in the U.S. I would love to go back there! We agree. Mexico is totally safe and a great destination for us here in Canada because it’s only a short 5 hour flight away. 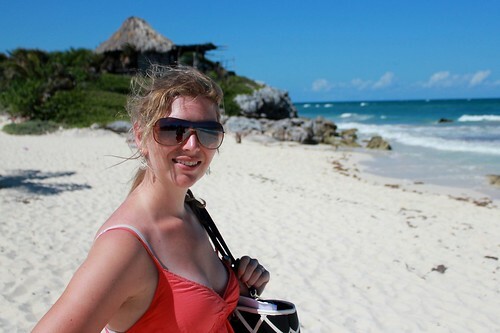 I went to Tulum last March & absolutely loved it. I stayed a bit further down the coast towards the Biosphere, but had a similar experience (beautiful beaches that were fairly deserted). Hopefully the area can retain its remote feel, despite being so close to Cancun. There is lots of room for development (at least in the area we were) so it’s hard to say if it will continue to be remote. But for the time being, its perfect for something a little different. I am surrounded by 20cm of snow at the moment in NZ! What a place – I need it now! Stunning, thanks! Wow – looks like you found your relaxing, romantic, hidden getaway! The morning soak looks heavenly! This looks like my kind of resort. Quiet and peaceful. Not overly polished and generic. Excellent ocean views. Can’t beat the ocean views! It was nice waking up to the sound of waves crashing. That looks great, and I agree the beaches near Tulum are some of the finest in Mexico – but that looks like a great place for a wedding also! We didn’t see a wedding but we agree! It’s a beautiful spot. It IS the perfect place for a wedding. We were married there in May…… Perfect weather, perfect location, perfect hosts, perfect accommodations, a wonderful holiday…..
“Uninterrupted relaxation” – this really looks like a perfect retreat to get away from the mental clutters of daily life and just spend time enjoying life. Beautiful photos – makes me want to get some of that relaxation now! That looks amazing. For those of us who work virtually or blog while we travel, planning trips that force us to relax is a very smart idea. It’s why we love going in to the back country (although I would take a morning soak int hat tub!). It’s so important to take a break sometimes. 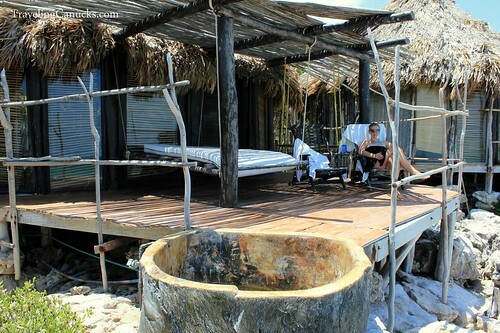 Since it was an eco-lodge with no internet in our villa, we had no choice! It was perfect. Wow…no electricity or internet. You brave, brave souls. We had a power outage here last night and I almost lost my mind! How do you keep that beer cold? Looks like a beautiful place though. Thanks for the peek. My idea of heaven. While I enjoyed the party islands in Fiji that I visited earlier this year – I think I had the most pleasant time when I was on Kuata – an island run by a local village and not quite as popular with tourists. While it was a bit run down and the food wasn’t remarkable, it was super relaxing. 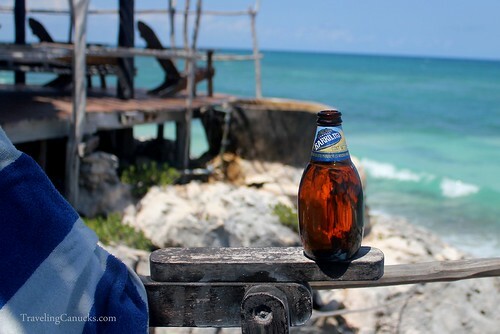 I love an empty beach, an ice cold beer, and the hot sun overhead. The best thing in the world. Incredible! So beautiful, looks like an unique eco lodge. Would love to go there one day! This place is gorgeous!!!!!!! I would have never left that tub. I have never heard of this place but it looks amazing. I love the hot tub! 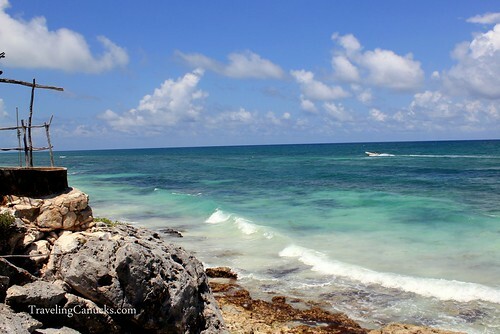 The beaches along the Riviera Maya are among our favorite beaches in the world! 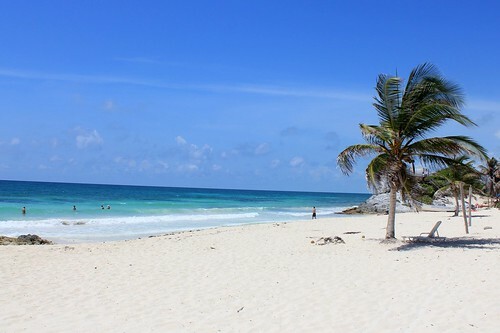 Love the beach in Tulum, could’ve spent hours just sitting there looking out at the ocean. 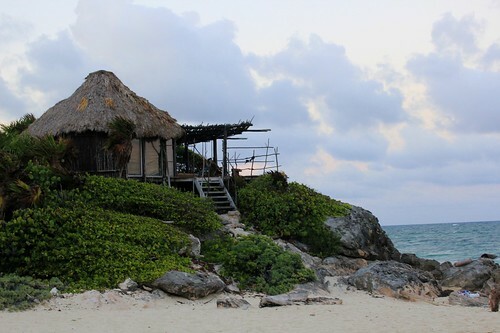 such beautiful pictures by Tulum. Those pictures are beautiful, they remind me my favorite caribbean island “Martinique”.